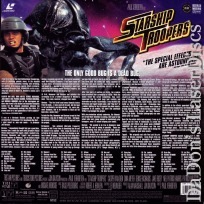 "The Only Good Bug is a Dead Bug"
Starship Troopers 1997 - 130 min. 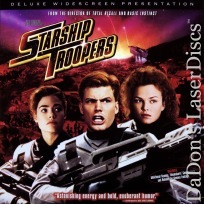 - Color Genre: Sci-Fi Rated R Country: USA LaserDisc Movie Storyline: Dutch director Paul Verhoeven (TOTAL RECALL, ROBOCOP) mixes big budget bug bashing with twisted satire of old Hollywood movies in this adaptation of Robert Heinlein's classic sci-fi novel. It's the future, Earth is at war, and the kids are all going off to fight giant killer bugs on the remote planet of Klendathu. 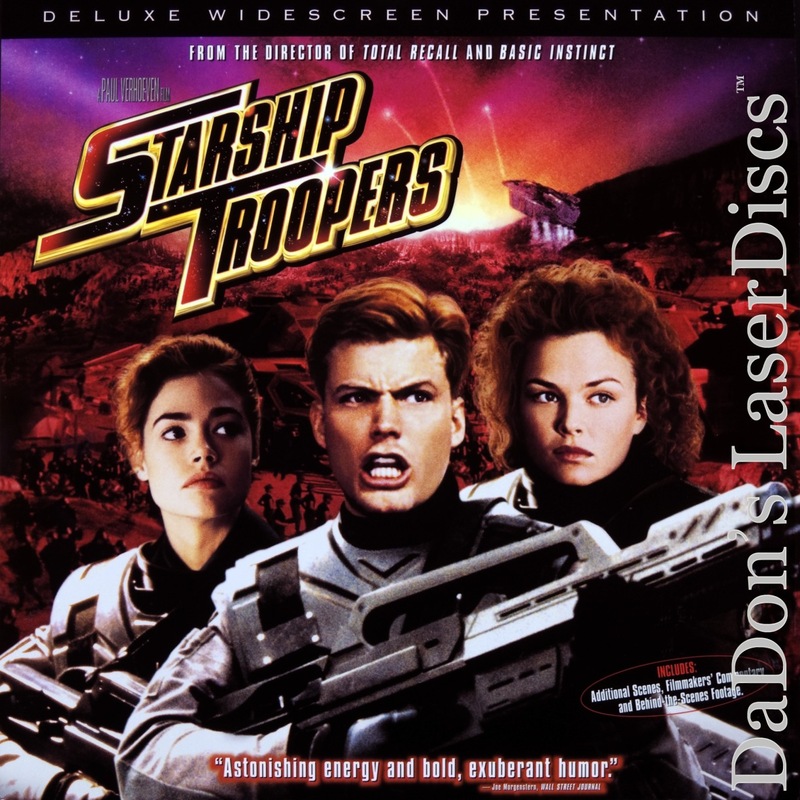 Casper Van Diem, Denise Richards, Dina Meyer, and Patrick Muldoon play some of the blandly attractive young recruits who engage in soap-opera style love triangles as they toughen up and learn to fight (and die) like soldiers. Michael Ironside is their gung-ho, one-armed leader. The real stars though, are the superbly animated bugs. 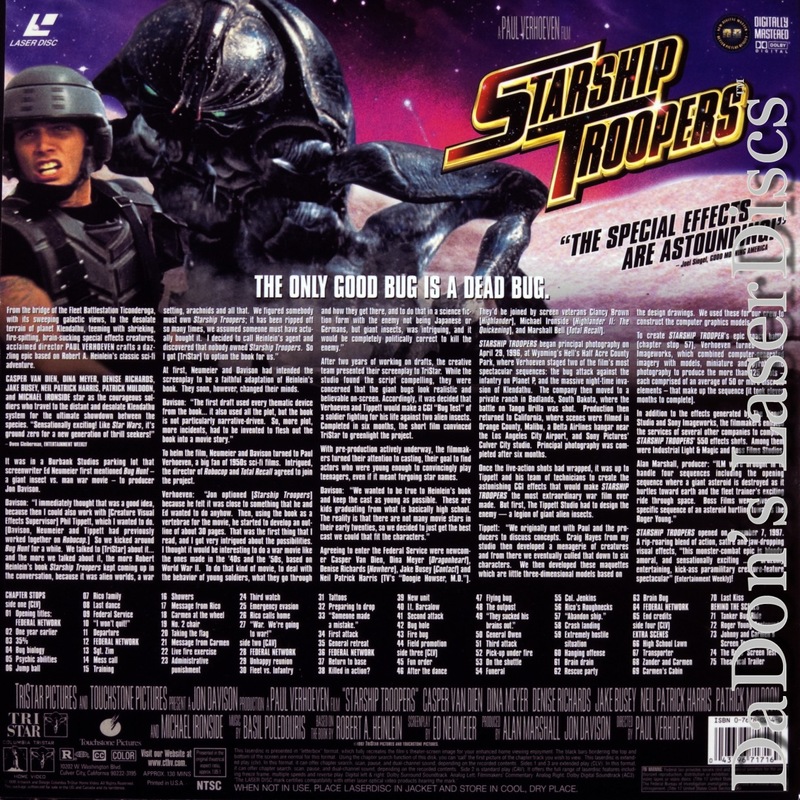 Packed to the rafters with jaw-dropping special effects and insane violence, the film managed to be a box office hit though it undoubtedly left some audiences confused at Verhoeven's slyly deadpan humor. By the time Neil Patrick Harris (TV's Doogie Howser) starts marching around in a Gestapo-style uniform, for example, it will be apparent this isn't STAR WARS. What it is however, is a rousing experience for mature viewers in the properly ironic frame of mind.